Congratulations to Michel Marion who won this week's Catch the Ace weekly draw, winning $859.00! 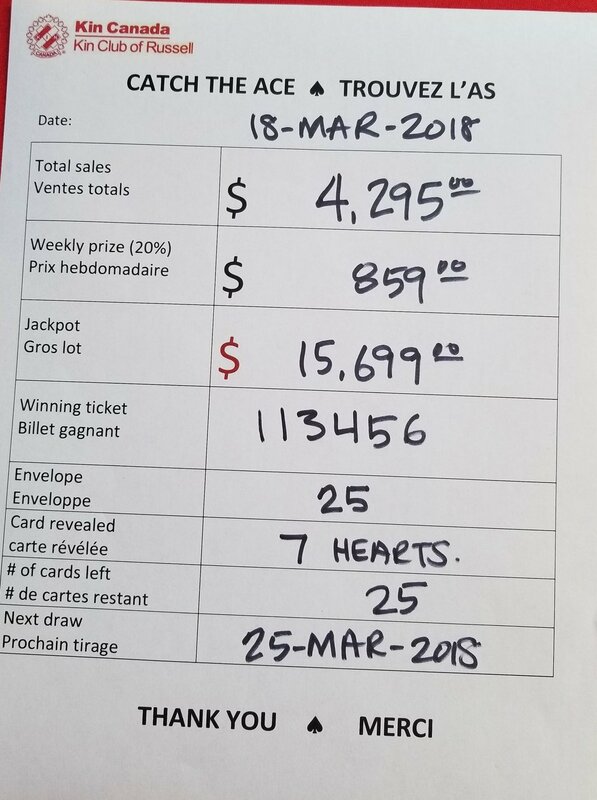 And no...the Ace of Spades was not found...Michel drew envelope #25 revealing the 7 of hearts...next week's jackpot is estimated to be at least $16,500. You can purchase tickets at Foodland, Pronto, Pierre et Fils, Etienne Brule Brewery or from any Kin Club of Russell member. If you reside in Ontario, we will also accept e-mail transfers to kindoug27@gmail.com (with your phone number and envelope number (s) you wish to have opened if you win the draw). To date, you have helped us raise over $26,000 for our Township!